Hi! I know Halloween is only 10ish days away, but I have a super cute and easy little garland that will be just perfect to add to your Halloween decor! 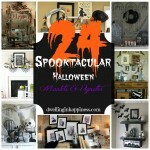 If you saw my 24 Spooktacular Halloween Mantels and Vignettes post, then you know that I don’t really decorate much for Halloween. We aren’t huge celebrators, though we will hand out candy and probably take Jade trick-or-treating when she’s older. That being said, I did create this cute little tassel garland so we’d have something kind of “spooky” outside our door so kiddos would actually want to come trick-or-treating to our house. And, it only cost me $1 to make! Holla! 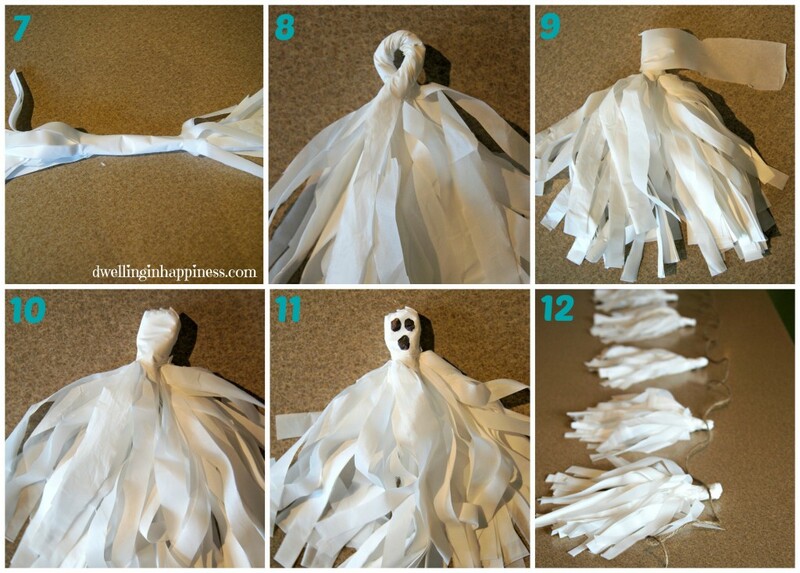 I’ve seen a lot of tassel garlands on Pinterest, and they’re all made with tissue paper. I wanted my garland to be hanging outside, and I knew if it rained on Halloween (which it has a little the last few years! ), then the tissue paper would fall apart. So, I thought I’d use a plastic Dollar Store tablecloth! This thing can get dumped in a bucket of water and it’d still come out looking just dandy. I had everything else already, so this was incredibly easy to make. 1. Start with your tablecloth fresh out of the plastic. unfold your tablecloth ONE time, NOT all of the way. It will still be folded up, so they’ll be more layers in each section. 2. 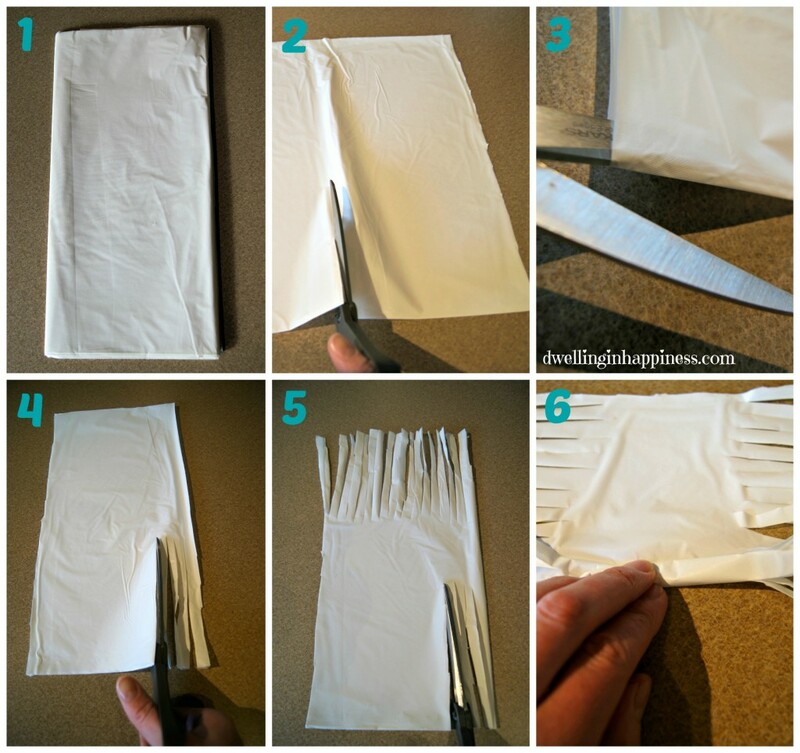 Cut up the crease of the fold for each section. 3. Cut through both ends of your tablecloth section, so the tassels will be free hanging, not connected. 4. Cut strips up one side, only about 1/3 of the way up. They don’t have to be perfect! 5. Flip your section and do the same on the other side, only cutting 1/3 of the way up. 6. Start rolling, with the “tassels” at either end. 7. Once all rolled up, hold the middle and shake so the tassels will hang more free and not be stuck to each other. 8. Twist just the middle section, and then overlap and add some hot glue to hold. 10. Glue in the back, and glue down any excess tablecloth on top to make it more round. 12. Repeat directions 1-11 to make as many ghosts as you wish! 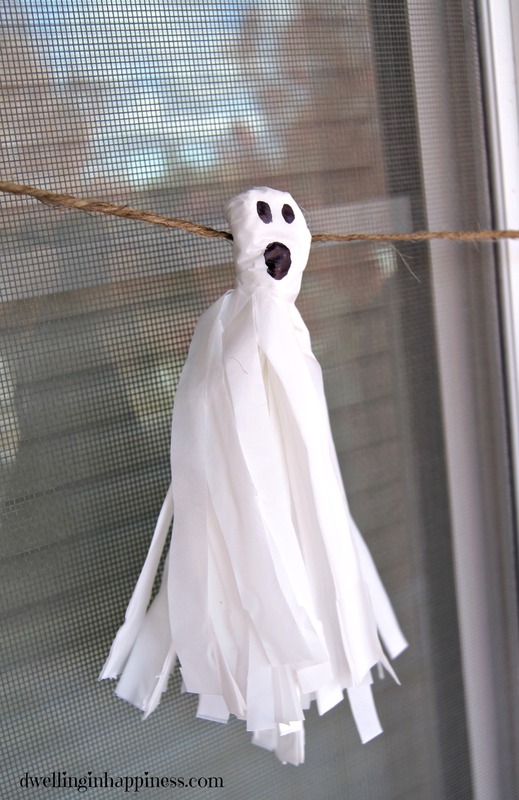 Put a line of hot glue on the back of the “head” and glue on some twine or yarn to make the ghosts look like they are free flying. 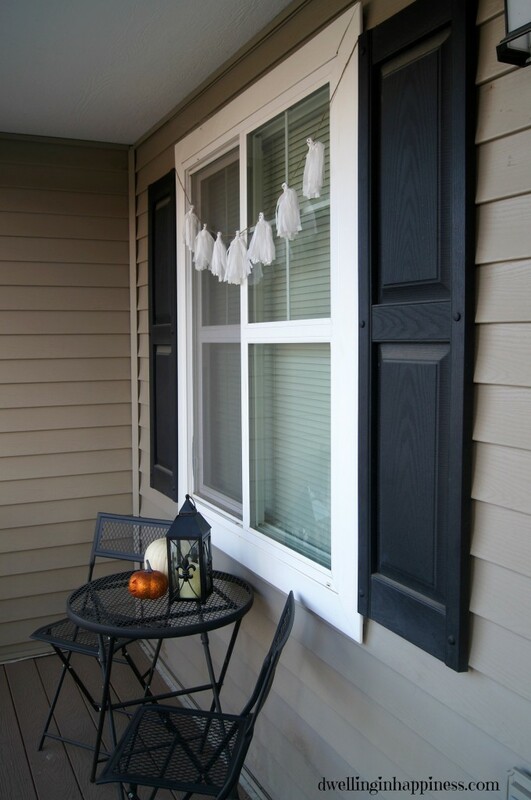 Hang outside where your Halloween guests can enjoy! I’m so loving how easy this was, and how cute it is!! And the price tag is truly my favorite part. AND, because it’s plastic, it will easily hold up for many Halloweens! I hope you all have a FAB rest of the week, friends! How do you decorate for Halloween? Do you go all out or just add a few little decorations? I’d love to know! Cute! I’m a fan of just a little spooky for Halloween, and this is perfect. Good idea to use the tablecloth instead of tissue paper. Love those little ghosts! What a great idea to use fabric that way they can be outside and they won’t get destroyed! Thanks Shonee!! I’m all about being able to reuse stuff, so this will still look perfect next year even if it’s outside! 🙂 Hope you’re having a fabulous week, friend! super cute! 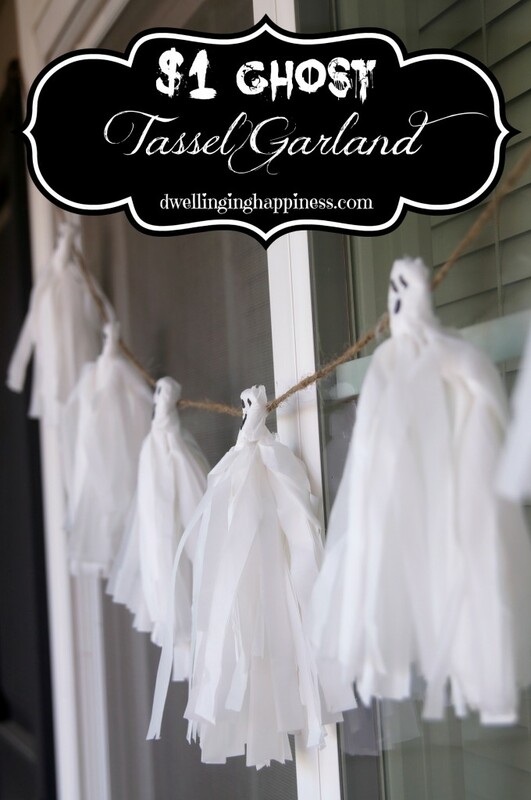 love your little ghost tassel garland and MUST have one for myself! One that will wrap all around my porch 🙂 Thanks for sharing the tute! They are so cute, Amanda!! Thank you, Kendra!! 🙂 Have a great weekend! Using a tablecloth is BRILLIANT! Wayyy more durable than tissue paper. This garland is too cute – I’ll have to make one! Thanks, friend! Super durable, until my cat gets to it and rips of some tassels… which happened, but you just gotta go with it anyway! 😉 Have a great weekend! G’day! How cute! Thanks for sharing at our #SayGdayParty! I’m so on board with anything that will only cost a dollar to make! They look so cute hanging outside of your window. Thanks for sharing them with us this week! Thanks Jamie! I’m all for a dollar craft, too! 🙂 Thanks for stopping by! Thank you, Natalie! I love simple. 🙂 Thanks so much for visiting! 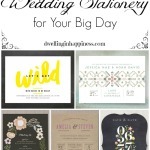 I Love these little cuties….pinned for next years projects!!!! Aww, thank you Christine!! They are so fun to have hanging outside! Can’t wait to use them again next year. 🙂 Hope you’re having a great week! This is so easy! 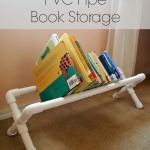 You could make this project for lots of other occasions, too. Instead of ghosts they could be colorful tassels. 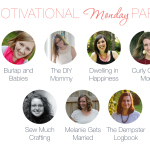 Thanks for sharing this with Hump Day Happenings! 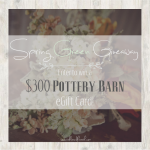 Jenna @ A Savory Feast recently posted…2014 Reader’s Survey! Totally, it’d look so cute for other holidays! Thanks for visiting, hope your week is great!! Super cute!! 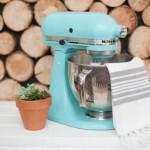 I’m pinning to the Show Me Saturday board.